Loving wife of Tom (dec). 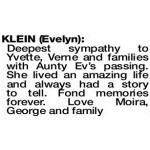 Devoted mother of Yvette, Lindsay and Verne. Respected mother-in-law of Rob and Tricia. Adored nan of Leisha and Matt, Steven and Olivia, Mark and Rhema, Jeremy and Cherie, Brydan and Lauren and Thomas. Treasured great-nanny of Austin, Scarlett and Eve. Special memories of you hold a dear place in each of our hearts. 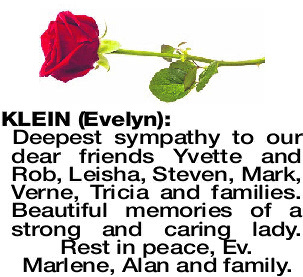 The Funeral Service for Mrs Evelyn Klein of Rockingham will be held in the Simplicity Chapel, 442 Scarborough Beach Road, Osborne Park on MONDAY (15.4.2019) commencing at 10.00am. 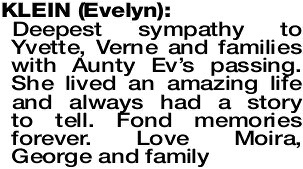 Happy memories of times spent with aunty Ev. Deepest sympathy to Yvette, Rob, Verne, Tricia and families. Rest in peace. Love Val, Mick, Paul, Carolynn, Lindy and Jon. 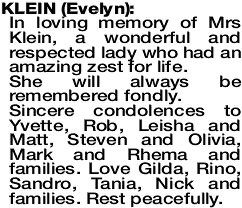 In loving memory of Mrs Klein, a wonderful and respected lady who had an amazing zest for life. She will always be remembered fondly. 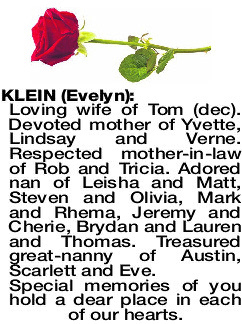 Sincere condolences to Yvette, Rob, Leisha and Matt, Steven and Olivia, Mark and Rhema and families. Love Gilda, Rino, Sandro, Tania, Nick and families. Rest peacefully. 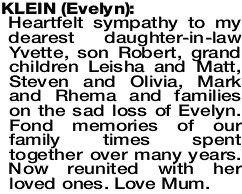 Heartfelt sympathy to my dearest daughter-in-law Yvette, son Robert, grand children Leisha and Matt, Steven and Olivia, Mark and Rhema and families on the sad loss of Evelyn. Fond memories of our family times spent together over many years. Now reunited with her loved ones. Love Mum. 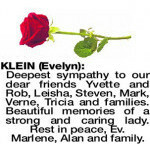 Deepest sympathy to our dear friends Yvette and Rob, Leisha, Steven, Mark, Verne, Tricia and families. Beautiful memories of a strong and caring lady. 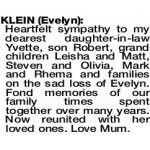 Rest in peace, Ev. Marlene, Alan and family.